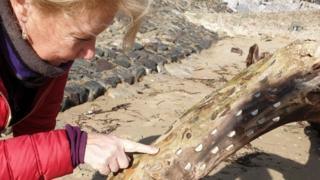 A couple have asked for help to solve the mystery of how a coin-studded tree trunk appeared on a south Wales beach. The length of a trunk is covered in battered British coins, all wedged into the wood. It was spotted by Rowli and Pat Rees during a walk in Mumbles, Swansea, near Blackpill. There is speculation the trunk could be part of a centuries-old tradition of 'wishing trees' - where coins are driven into a tree to bring good luck. The practice has been recorded all over the British Isles for hundreds of years - from the Irish Republic to the Scottish Highlands. Rowli Rees said: "It's been battered and it is really a bit of driftwood. My only thought is it's been brought down by a river, maybe?" The last noted coin-tree to appear in Wales was at Portmeirion in Snowdonia, where a fallen tree and several trunks were studded with two-pence pieces . But Mr Rees is not convinced: " It looks like an art installation or something because these coins are bent."